I often find shopping online to be faster and more convenient than shopping in a brick-and-mortar store, not to mention that the choices and prices are often better online as well. 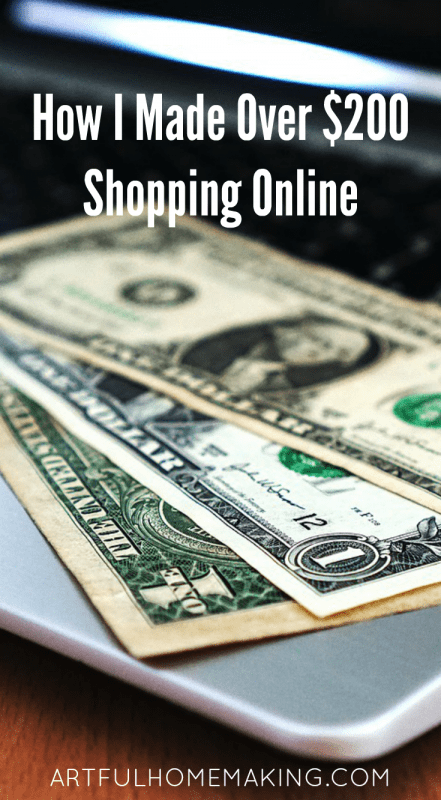 A couple of years ago I heard about a new online shopping program that was free to join and promised to pay back a percentage of each online purchase. I was a little skeptical at first but after looking into it decided to go ahead. I even got an immediate cash bonus after my first purchase just for signing up. Since signing up with Ebates, my husband and I have earned over $200.00 by using this free program. All I have to do is remember to go to this site each time I am planning to make a purchase, find the name of the store where I plan to shop, and click through a link to that store’s site. That’s it! It’s really easy, and depending on the store, I can earn from 1% up to 20% cash back (most stores offer from 2% to 4% cash back). As an example, a $100 purchase with 6% cash back gives me $6.00 cash just for clicking through this site! There are literally hundreds of web sites that participate, including Walmart, Sears, Lands’ End, Half.com, Vitacost, Walgreens, and many, many more! Even Amazon and eBay offer cash back through Ebates. Once your earnings reach the eligible amount (over $5.00), Ebates will send you a payment. You can choose to get a check or get paid through PayPal. You can join for free through this link, and you’ll earn $10 after your first purchase! It’s a super easy way to make some extra cash! Note: This post contains my referral link. Read my full disclosure policy here. Sharing here. Thanks for sharing. Every little bit helps!